For some (read: casual users), a social network like the photo-sharing app Instagram is a great place to post cute pictures of their newborn baby to share with close friends and family. For others (read: power users), Instagram is a place to market yourself or your brand. A devoted and strong Instagram following can boost your other social accounts and show off your online sociability. But because of its mobile-only nature, it can be a difficult network to infiltrate, which is why I’ve put this post together. 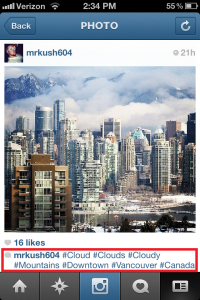 If you’re unfamiliar with Instagram, I recommend this beginner’s guide. Hot girls. Sun flares. Sunsets. Clouds. Skylines. Buildings. Beaches. Nature. Food. These are some of the Instagram’s community’s favorite things – just check out the “Popular” section. And since they care about these things, you’ll need to. Photos with these features in them are easier to tag (more on this in the next section) and you’ll see more Likes. If you’re only posting images of your friends playing Xbox or of your household appliances, it’s going to make it that much more difficult to gain a following. *Unless you’re a celebrity. If you have a Bieber-fever following, people will instinctively flock to you like the salmon of Capistrano. Kindly click out of this post, create your Instagram account and tweet the link to your millions of followers. One of the reasons I said Instagram is hard to infiltrate is because, with so many users, it’s hard to know where to look for the conversation. Start with popular tags. These are going to get your images in front of more people. If your photo is a sunset, tag it with “#sunset,” “#sky” and “#clouds.” Then ask yourself what colors and other features are in the photo and tag accordingly. You can even post these as a comment in case you want to add more. Remember, however, that Instagram only allows 30 tags at a time. Once you’re adding tags, you’ll start seeing an increase in Likes (and potentially followers). Other popular tags might come from websites and contests. 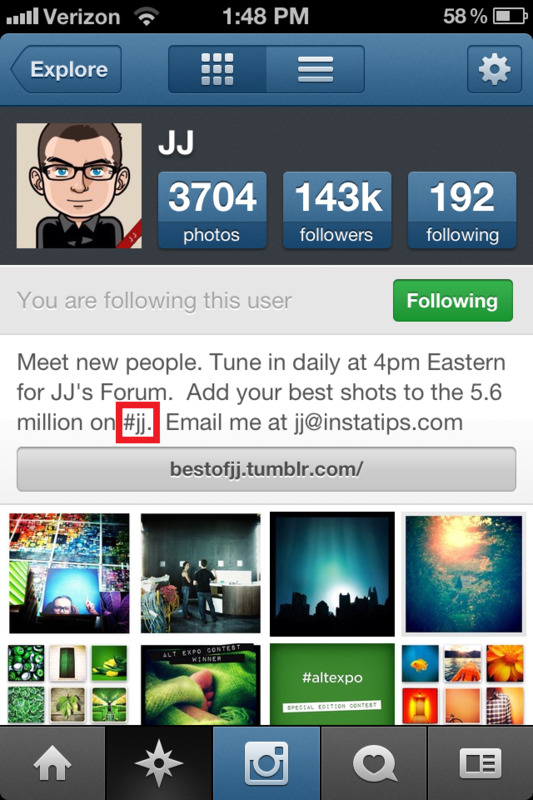 One immensely popular tag you might see is #jj, which originated with @joshjohnson‘s profile. 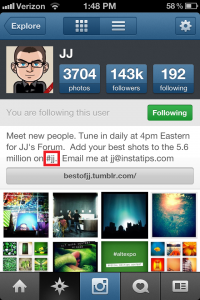 He hosts daily discussions – a fantastic way to join the Instagram conversation. 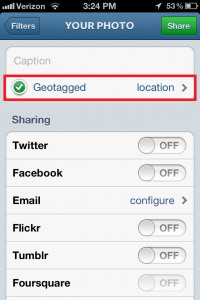 Moreover, remember to geotag your photos. After you’re finished with the filters screen, tap “Enable Geotag.” If you leave this section green with a check mark, an approximate location will be attached. You can tap it again to search for a specific place. 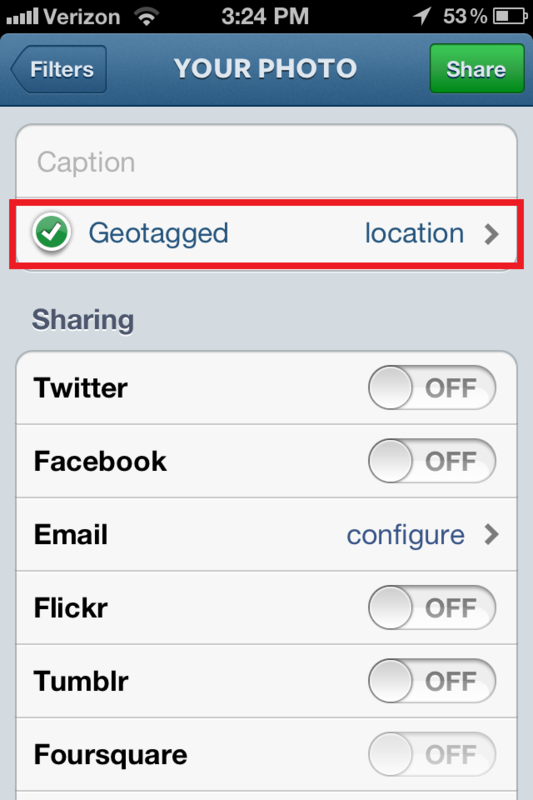 When you choose a specific place, anyone can see all the photos tagged at this location. Yet another source of exposure. Tell people about yourself – where you live, what you take your photos with, and what types of photos you post. And what about that one link you get? 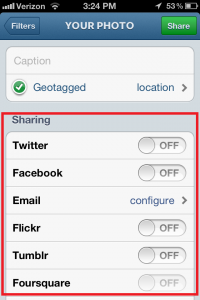 Add a link to something social related, whether it’s your Facebook, Twitter or Flickr page. Use these three tools. They take the mobile app and put it on your desktop with more features. They make it easier to comment, Like and view photos. Play around with them, choose your favorite (Statigram gives you crazy amounts of analytics) and stick with it. 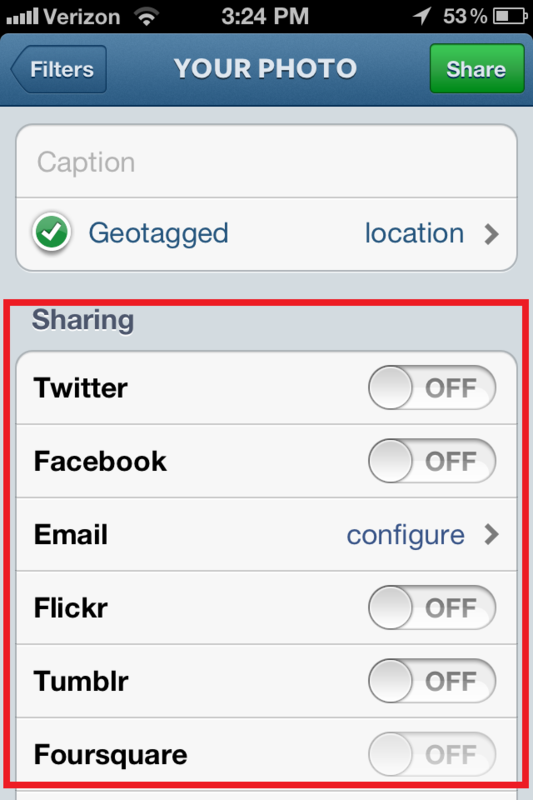 There’s a reason Instagram integrates Facebook, Foursquare, Tumblr, and Twitter into its sharing options: You know, so you can share your photos. Use your other social accounts to help your Instagram account gain more exposure. Remember, you can always post to these networks after you upload your image to Instagram. This way you’re able to change the tags to be more effective on Twitter, or change the caption to be more appropriate for Facebook. Seemingly every week there’s a new Instagram website or tool to take advantage of millions of Instagram users. 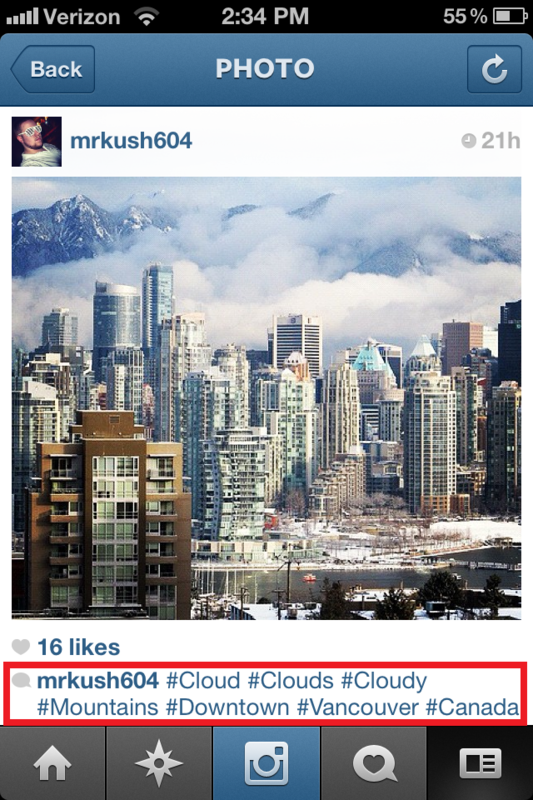 For instance, Instaprints is a new website that actually lets you sell your photos and make money. And apps like Picstitch let you combine multiple photos to make clever designs. Be on the lookout for new apps and tools, and don’t be afraid to try new strategies. This post was written by Bryden McGrath, a social media strategist at the Seattle internet marketing company Portent, Inc. When he’s not turning mediocre iPhone photos into awesome, filter-filled Instagram shots, he enjoys freelance writing and praying Seattle professional sports teams won’t be terrible forever. How much time do you need to put into Instagram to really make it effective? I realize that probably depends on a lot of factors, but do you need to upload and comment on pics every day? Several times a day? I imagine it’s much more useful if you’re always there interacting, just like with all other social media programs. Derek, thanks for the comment! For Instagram to be worth the effort, you need to be adding to the community — quality photographs, uploading images consistently (once a day is a solid goal, maybe twice a day on weekends), and commenting on other photography to make connections. But as you said: Just like with all social media, the more time you have to devote to building your presence or brand, the more successful you’ll likely be. Using Instagram to build connections sounds really interesting. I mean, I never really thought about it as anything beyond an app to be used for sharing pictures. But using it to build useful and string connections, I guess, is the ultimate optimization of the app. And now that I think of it, yes, it is indeed a brilliant way to find like people who can form useful connections.